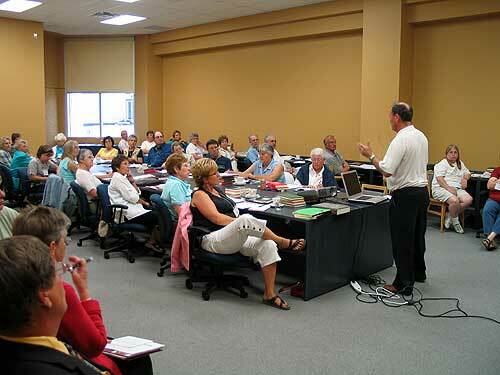 A second local history workshop was organized by the MHS in collaboration with Friesens History Books and Brandon University, following on a successful one held last September at Dalnavert. Its purpose was to provide helpful tips and information to groups which are preparing histories of their community or family. The one, held in the Brandon University library, was attended by 45 people from communities including Arden, Ashern, Birtle, Brandon, Cartwright, Grandview, Neepawa, Notre Dame, Oak Lake, Redvers (Saskatchewan), Rossburn, St. Laurent, Sinclair, Strathclair, and Treherne. Ted Miller of Friesens described some of the materials that his firm makes available to history groups, then MHS Past President Gordon Goldsborough gave an overview of resources that are available around the province to support local history projects. Morris Mott of the BU History Department gave some pointers for successful historical writing, then Tom Mitchell, BU’s archivist, spoke on the use of archival resources. Following a lunch break, Mitchell gave attendees a tour of his S. J. McKee Archives which holds, among its other collections, the records of Manitoba Pool Elevators and the only surviving copies of the Brandon Daily Sun newspaper. In the afternoon, Linda Hiebert of Friesens spoke about the preparation of materials and photographs for publication, then Gordon Goldsborough concluded the day with a discussion of oral history techniques and tips for popular history writing, as well as some pitfalls of historical writing in the 21st century. The workshop was well received, and we will organize further ones as interest warrants. 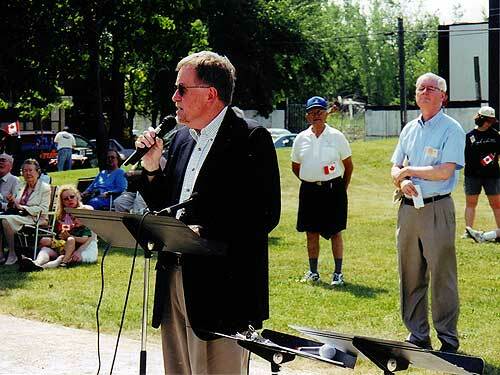 Canada Day, at Ross House Museum in Joe Zuken Park, this year featured a special program on the unveiling of a bronze plaque in commemoration of Joseph Zuken’s 42-year record of service to the city of Winnipeg, first as a school board member and then as an alderman and city councilor. 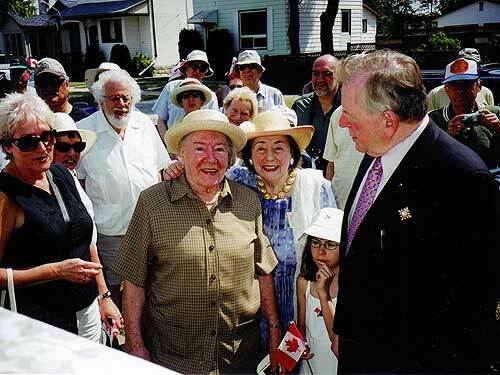 His Honour John Harvard, Lieutenant Governor of Manitoba, presided at the unveiling of the plaque, together with Clara Zuken, Joe Zuken’s widow. 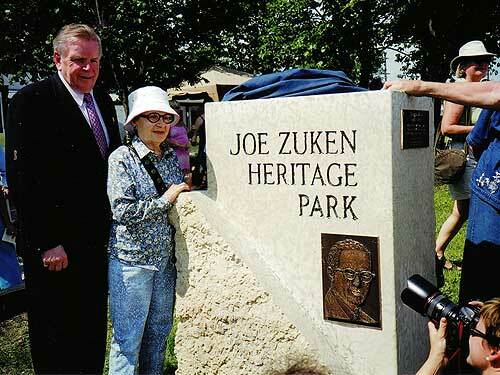 John Harvard and Clara Zuken unveil plaque in Joe Zuken Park. Preceding the unveiling a commemoration program took place in the amphitheatre attended by over 200 people. “Today,” Mr . Harvard noted, “Joe Zuken’s vision lives on in the Joseph Zuken Memorial Association and the Joseph Zuken Memorial Trust Fund, which have supported many social, political and cultural organizations in Winnipeg. 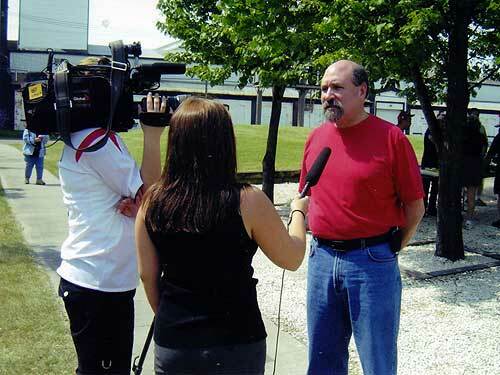 His vision also lives on in the citizen Activist Award, which honours women and men and organizations for a similar commitment to our community”. William Neville in a memorial address gave some personal recollections of his years on City Council with Joe Zuken. Other speakers were Christine Melnick, Minister of Family Services and Housing for the Manitoba government, and Councillor Harvey Smith for the City Council. Following the unveiling of the plaque, some members of the cast of the musical “Strike” (about the Winnipeg General Strike of 1919), sang several numbers from that production, introduced by director and composer Danny Schur. 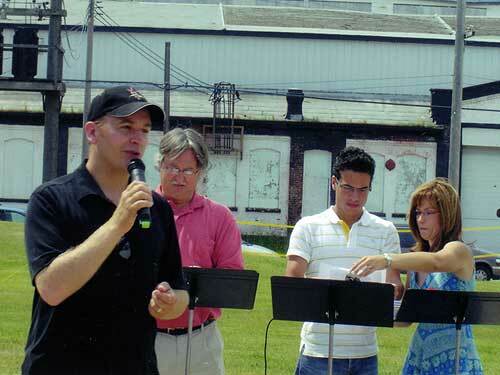 The singers, Dana Horax, Taras Luchak and Marc Devigne, performed against the background of the former Vulcan Iron Works factory (across the street from Joe Zuken Park) which was one of the places where the workers went on strike. Harry Duckwoth, MHS vice president, served as MC (pinch hitting for president Jack Bumsted who was ill). Neil Cohen, chair of the Zuken Memorial Association expressed thanks to everyone in closing the program. Sponsors included the Jewish Foundation of Manitoba, the Winnipeg Foundation, the Manitoba Heritage Grants Program, the Winnipeg Per Capita Grant Program, the Zuken Memorial Association, the Canada Day Fund, CUPE Manitoba, and several private donors. The annual barbecue and Canada birthday cake then followed. The Canada Day planning committee included Gordon Goldsborough, MHS immediate past president, Victor Sawelo, manager, Ross House Museum, Abe and Bertha Arnold, Lily Stearns, Neil Cohen, Norman Larson, Bill Fraser and Janice Deitch. Lea Gunner was the publicist and Victor Dobchuk was the videographer. Doug Roxburgh was the piper. 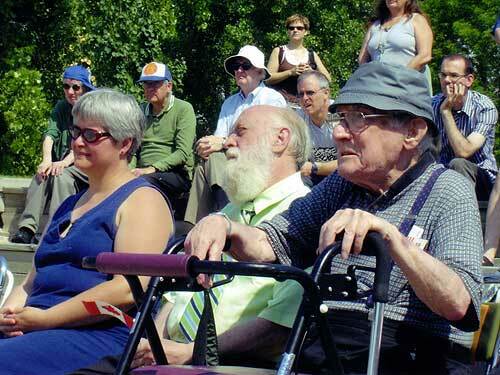 MLA Christine Melnick, Winnipeg councillor Harvey Smith, and Abe Arnold at the ceremony. Bill Neville speaking, MHS vice-president Harry Duckworth on far right. L-R: Danny Schur, Taras Luchak, Marc Devigne, and Dana Horax perform excerpts from Schur’s musical Strike! . 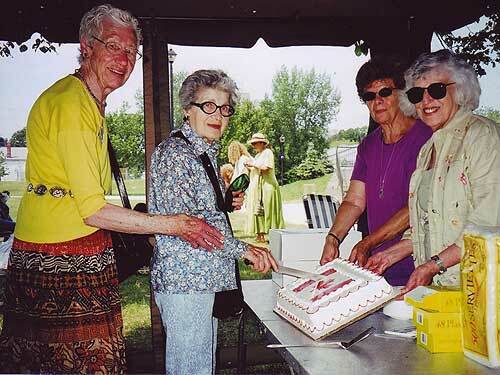 Bertha Arnold (left) and Clara Zuken (center) cutting cake. Plaque artist Elfriede Berger (front centre) with the Honourable John Harvard. More than forty years ago, a television series called ‘Dragnet’ became famous for a catchphrase used by one of its characters, a police detective named Sergeant Joe Friday. When questioning witnesses, Friday always repeated the same request, delivered in an emotionless monotone: ‘All I want is the facts, just give me the facts.’ The monotone was intended to indicate Friday’s objectivity and to extract from his witness a response devoid of personal bias and colouration. Of course he seldom got ‘just the facts’—which from our perspective is exactly the point. Somehow, just as the popular mind in the 1950s associated Joe Friday with facts, so it has more recently come to think of historians as dealing in the same coin. The equation of facts and history has doubtless been assisted by the traditional way of teaching history in the schools, by marching out one name, date, event after another for students to commit to memory and regurgitate at the appropriate time in the course of an examination. Of course historians do rely on facts as their basic building blocks; but they do not think of them the way Sergeant Friday did, nor do they use them the way common opinion believes they do. The Canadian Oxford Dictionary offers several meanings for ‘fact’. The most familiar is probably number 1: ‘a thing that is known to have occurred, to exist, or to be true,’ although number 4—‘truth, reality’—is also very common. Facts, as ‘Dragnet’ suggested, are true things, unsullied by any process of interpretation or conclusion. Such things may exist, but they are much harder to come by than one might expect, for several reasons. One problem is the language in which ‘facts’ must be stated. Another is the context in which they become significant. Over the last century we have become increasingly aware that language is not a neutral instrument, but one that carries with it a heavy freight of cultural experience and usage. ‘John Cabot discovered Newfoundland in 1497’ may seem a straightforward statement of fact, but at least half of the words in it conjure up a whole host of meanings. One of those words is ‘discovered’. The implication is that what Cabot found was previously unknown—but of course an Aboriginal population had been living in the area for millennia. Even qualifying the word ‘discovered’ with the phrase ‘by Europeans’ doesn’t help much, since we now know that the Vikings had settled at L’Anse aux Meadows in the eleventh century, and even they may not have been the first Europeans to cross the Atlantic. ‘Discovery’ is a complex concept. The term ‘Newfoundland’ is equally problematic, since in modern geographic terms Cabot was not at all precise about his movements, and the land he sighted may not have been part of the island that we know as Newfoundland today. Indeed, Cabot called the land he saw ‘the NewFounde Land’, and it was only later that the label was applied to the island. Moreover, Cabot’s sightings were not confirmed by anything other than vague self-declarations. To top matters off, there are questions about the identity of John Cabot himself, who started in Italy as Giovanni (or Zuan) Caboto and became John Cabot Montecalunya, a resident of Valencia, in the early 1490s, before he called himself John Cabot of Bristol. Almost all but the most simplistic statements are subject to the same difficulties. Philosophers have spent thousands of years trying to formulate ‘true’ statements, with very little success, and historians are unlikely to do much better. Almost any ‘factual’ statement worth making has to be expressed in a language heavily weighted with values and contexts. Language is only one of the challenges in the quest for the fact. Even if facts could be expressed in a neutral language, such as numbers, we would still need to decide which facts are important. At any given moment there exists a virtual infinity of pieces of information that could be isolated and stated. Most ‘historical facts’ are simply labels of events and dates, names, movements , and artifacts which by themselves do not tell us very much. They are not statements in which anything is asserted, and therefore they have no standing as facts. Only when their significance is implicitly or explicitly understood do they acquire any utility or susceptibility to truth. ‘The Battle of Vimy Ridge’ is not a fact, since it does not assert anything capable of being either true or false. ‘The Battle of Vimy Ridge in 1917 was won by the Canadian army’ is an assertion the validity of which can be assessed. Whether it is false or true (and hence ‘a fact’) is another matter entirely. The validity of the statement requires a detailed account of the battle in the context of the war. One of the chief benefits of modern historical study is that it promotes a healthy skepticism about the neutrality and ultimate truth of the notorious fact. Taken by itself, in isolation, the fact has little meaning. It is only when facts are arranged into some larger picture—some sort of interpretive account—that they acquire significance. Our difficulty with old buildings that we wish to preserve often is that we cannot fit them into enough stories, cannot provide them with enough interpretive pictures to make them meaningful. Those interpretive pictures themselves are subject to change over time. Anyone today who reads a Canadian history textbook written thirty years ago will be struck by the almost complete absence of any reference to women as important historical figures. Yet thirty years ago the majority of readers—even female readers—took that absence for granted. The absence of women does not mean that women were not present. It simply means that historians of that generation did not regard their activities as worthy of attention. The historian can uncover whole constellations of new facts simply by asking a new question of the historical record, as happened when some scholars asked: ‘What about the women?’ History is not the study of something eternally fixed, of something that can be ‘discovered’, but rather the continual dynamic reinvestigation and re-evaluation of the past. In 1882 the Hudson’s Bay Company razed Upper Fort Garry to the ground as a bunch of useless old buildings. Today there are several initiatives for reconstructing it as an important artifact of our heritage. We are grateful for all these donations, without which the development of the gardens would not have been possible. Margory Margaret Rose Walker, a MHS member, died in Winnipeg on July 27 at 64 years. Marge taught in Winnipeg, Selkirk, Roblin, Mayo, Dauphin, and Chauteauguay schools, mainly grade 1, until her retirement in 1996. She participated in MHS field trips and other programs. The MHS Program Committee has arranged a guided tour of the Winnipeg Police Museum for 1:00 pm on Saturday, October 14. The museum, which contains many interesting exhibits and artifacts, is located at 130 Allard Avenue in St. James (Westwood, south of Portage Avenue). There is no charge for the tour but a donation will be accepted. Please call Carl James at 204-631-5971 to confirm your attendance or for more information. Please call our info line (204-943-2835) for more information about prices or times and/or check the MHS web site. Presentation by Giles Bugailiskis, Curator of the Wheeler exhibit on display at the Dalnavert Visitors’ Centre. A prominent and prolific architect, Wheeler’s many commissions included Dalnavert House, Holy Trinity Anglican Church, the G. F. and J. Galt’s Warehouse and Senator Sanford’s Warehouse. Please join us for a special Tea Lunch. Bring your favorite Tea Pot and personal story of you wish. Prizes will be awarded for the most interesting vintage, contemporary, or whimsical teapot. The afternoon will include a special luncheon with sandwiches, dainties, wonderful teas (Teas by Cornelia Bean) and a display of your wonderful teapots. Hats (need we say more) - you are encouraged to dress up and wear your favorite hat. There will be guest speakers, judging of teapots and a museum tour. Display tables will be provided. Lunch starts at 12:45. The cost is $15 per person including tax. Tours are $2.50 extra. Tickets may be purchased at Dalnavert (cash or cheque). For reservations or more information please call Janet Hildebrand 204-375-6628 or 204-297-7141 or Marg Kentner at Dalnavert 204-943-2835. Enjoy dinner and a tour of Dalnavert at night. Does the ghost of Sir Hugh John Macdonald still roam the halls or are there others that inhabit the house? A Medium and Paranormal Investigator will attempt to find out! Tickets are $69.95 per person and are available online at www.ghosttoghost.ca. A unique opportunity to purchase quality items produced by members of the Winnipeg Embroiderers’ Guild. Admission to the sale is free; Museum admission is half-price. December 15, 16, 17, 20, 21 and 22 at 7:30 pm An enduring favourite! Book early to avoid disappointment. We’re also hoping to have some sort of Halloween reading(s) this year; still working on some ideas! The “new” Dalnavert Gift Shop is well into its second year of operation, and by all reports, seems to be making a substantial financial contribution to the overall operation of the Museum and Visitors Centre. Those who arrive for the first time, either local or from out of town aree pleasantly surprised by the display and depth of merchandise offered for sale. Last summer, Katheryn Wreford and her mother were in the shop, as Katheryn had a break from performing at Rainbow Stage; both loved the Raku pottery and jewelry they were able to purchase as gifts. Our signature brown paper shopping bags and elegant gift certificates finished off what they professed to be a very lovely visit and shopping experience. It is difficult to answer the question, “What type of goods sell better than others?” as the clientele who visit the museum and shop, or use the auditorium are quite diverse in origin, age and reasons for being there. There is no “target market”. Some examples – an out-of-town couple negotiated for a delicate vintage handkerchief, which had been donated by a volunteer of the museum. They gave $20 for the hankie, which was placed for them in one of Dalnavert’s quilt patterned gift boxes. The volunteer who donated it was quite surprised, to say the least. A much beloved repeat shopper and storyteller is a lady from Edmonton. She visits awhile and purchases many of the natural body and foot butters made by the Rocky Mountain Soap Company. The staff and volunteers are always afraid that she will realize this line is probably available near her home, as it is made in Alberta. Tourist and local visitors are always appreciative that they find many interesting hand-fashioned gifts and jewelry made in Manitoba and other parts of Canada. Out-of town guests at a wedding held on the veranda practically cleaned out a collection of architecturally oriented cards and fridge magnets. A tour bus organizer from Chicago took home with her a large floor candelabrum, which after being carefully packed in two tall boxes fitted together, the driver was barely able to store in the hold of the bus. Children and adults alike love to browse through the variety of teddy bears, books, toys, foodstuffs, personal bath products, hand-made shoulder bags, scarves, china, crystal: a wide and attractive array of giftware. There is a renewed interest in the Historical Atlas published by MHS for Manitoba’s Centennial in 1970. A government department has taken to giving one of these as a retirement gift. Visitors and volunteers have purchased them as well. The fact that they were limited editions and signed by the then lieutenant governor, certainly helps in the selling process. Working in the gift shop and reception area has advantages beyond the joy of selling (and buying things). One meets amazing people, such as the grandson and great-grandson of Charles Wheeler, architect of Dalnavert, who were visiting from Toronto and came by chance. Bill Wheeler, the grandson, was thrilled to find that the house has been so wonderfully restored and is an open museum. An elderly woman arrived one day and told us that she had visited Dalnavert as a child when her mother and a friend had come to see Daisy, Sir Hugh John Macdonald’s daughter – such a connection. The lady now lives in Stonewall. Efforts of a promotional nature are now underway. Retail stores always need more traffic and the hope is to attract not only people who live near Dalnavert, but individuals who come to work in the Broadway area. Please remember that the fall and Christmas gift giving season is soon upon us and give the museum shop first perusal. There is no easier way to financially support Dalnavert. Some great new gift and tabletop items are arriving soon and a complimentary gift wrapping service should be in operation by mid-September. Enjoy your fall and we hope to see you soon. Click here for an up-to-date list of Centennial Farm award recipients. A cairn and plaque were unveiled in Portage la Prairie to recognize W. H. Vopni and his family in a park on the south side of Saskatchewan Avenue East, across from Second Street NE. W. H. Vopni founded the Vopni Press in 1946 and took over the publishing of the Daily Graphic and Portage Leader in the same year. Over the next 24 years, Vopni purchased The Neepawa Press, Macgregor Herald, and the Gladstone Age Press. The business was later sold to its present owner who moved it to 19th Street SW in 1984. 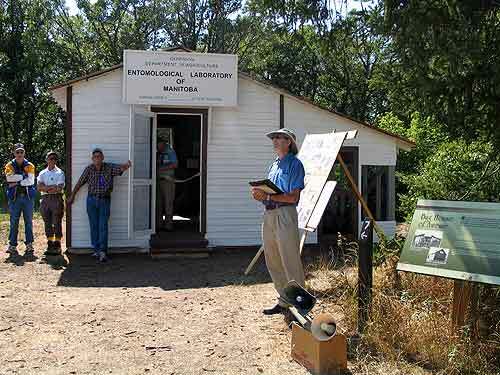 On August 13, there was a re-dedication ceremony for Norman Criddle’s entomological laboratory building at the Criddle-Vane homestead site near Carberry. The top photo shows a group having a tour of the site, standing in front of St. Albans, the home built in 1906. The family flag flies in the foreground. The bottom photo shows Dr. Neil Holliday of the University of Manitoba (who wrote the article about Norman Criddle in a recent issue of Manitoba History) on the right, speaking about Norman’s scientific legacy. The rebuilt laboratory building is in the background, along with some of the men who helped in its restoration. A memorial statue of Lt. Col. William (Billy) Barker was unveiled in the Dauphin City Hall courtyard on July 26. Dauphin-Swan River MP Inky Mark commissioned the statue which was created by sculptor John Boxtel. Marie Barker, the widow of Billy Barker’s younger brother Orville unveiled the statue after members of Canada’s Snow Birds flew overhead. Bill Barker, who was born in Dauphin, received a Victoria Cross and became Canada’s most decorated soldier after a historic air battle in 1918. A 18' by 25' house originally built by Edmund Manley in 1880, approximately four miles south of Newdale, was dismantled and sent to the Minnedosa Heritage Museum. The house is being rebuilt using the same logs for the walls. A number of antiques currently in storage will be displayed in the Manley house when it is completed. A new book Trails to Rails deals with the history of the railway in Minnedosa. Proceeds from the sale of the book go to a fund for the restoration of the Minnedosa train station. The book sells for $30, tax included, with an additional $5 if the book is mailed to a destination within Canada. Address orders to: Save Our Station, Box 1808, Minnedosa, Manitoba R0J 1E0. A group has been set up to preserve Harley House, the oldest house in Swan River. It was built in 1900 and served as the residence and office of the government land agent, Hugh Harley. Most of the Swan Valley homesteads were issued from this house. Under the stucco is a beautiful log structure that the Harley House Steering Committee hopes to restore. Persons with information or pictures of the Harley House are asked to contact Scott Tibble at 204-539-2570 or Karla Pratt at 204-734-6202 or email harleyhouse1900@hotmail.com. Winkler residents had a chance to explore “a day in the life” at the Pembina Thresherman’s Museum on August 7. Volunteers dressed in appropriate period costume demonstrated activities of an earlier era - soap making, flour milling, threshing, rope making, etc. Volunteers role played as pupils in the musem’s one room school. There was a traditional school picnic with races and other competitions and a picnic basket auction. A vow renewal ceremony took place in the old church chapel. The national public affairs TV channel CPAC is seeking interview subjects for a documentary on the 1923 collapse of the Home Bank of Canada. The Home Bank had branches across Manitoba including Winnipeg, Crystal City, Franklin, Goodlands, Grandview, Lyleton, Marquette, and Rosser. Known as a farmers’ bank, the bank was also popular with small depositors, trade unions, and Catholic parishes. Its shares were sold through the United Grain Growers. The Home Bank crashed 83 years ago due to fraud by management. The collapse affected 60,000 depositors nationwide. The resulting scandal led to a 1924 Royal Commission and inspired numerous banking reforms such as deposit insurance. CPAC seeks to interview any descendants of Home Bank depositors or employees, or any Manitoban who has their own story of the bank that crashed on 17 August 1923. When was the last time that you paused to view what may be one of Winnipeg’s most important small historic parks — Upper Fort Garry Park, tucked between Main and Fort Street, just south of the Manitoba Club? Far too many of us, when passing out of downtown Winnipeg, endeavour to leave it behind as quickly as possible, missing a small park that had its origins with one of Winnipeg’s most historically important structures — Upper Fort Garry. Whereas it was once the hub of activity for the Red River Settlement and the administrative centre for the activities of the Hudson’s Bay Company in the great North West, by the 1870s much had changed and the city of Winnipeg was rapidly encroaching upon it. 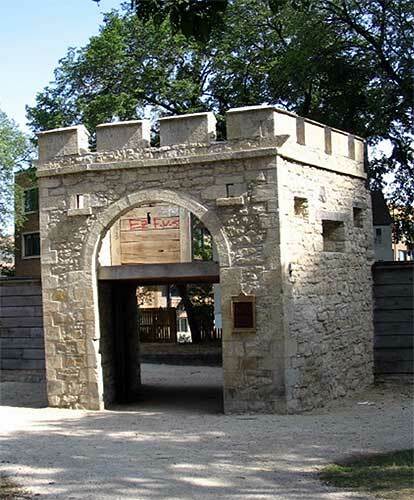 In 1882 its walls were dismantled and used as foundation material for other Winnipeg buildings and the great fort was reduced to last remnant, the Governor’s Gate (the North Gate). 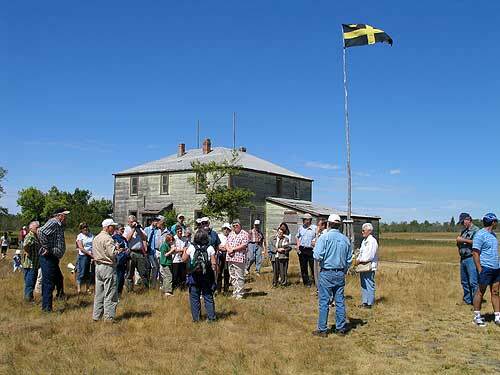 Long neglected, Upper Fort Garry is once again in the news. Over one hundred and fifteen years ago the preservation of this important historical element is due in part to the early efforts of the Manitoba Historical Society. In the late 1880s the Manitoba Historical Society was already promoting the value of preserving the last vestige of Upper Fort Garry, the North Gate. However, a proposal that would have seen the creation of a sizable park around that gate was deemed too costly by the City Council and thus rejected. The creation of the park continued to be a topical issue with George Bryce debating the issue of the fort’s relevance. A recent edition of the Real Estate News relates that “It was felt that few knew or really cared about the history of the fort that had been such a dominant feature of the community for decades.” In 1897, the Hudson’s Bay Company finally agreed to a request from Winnipeg’s City Council that a park be created around the Gate. In a state of disrepair, $500 was spent restoring the North Gate of Upper Fort Garry and creating the Park. With care and repairs ignored for many decades it wasn’t until 1983 that funds ($160,000) were found in a cost shared federal/provincial split to again restore the Gate, upgrade the interpretative signs and erect the replica wooden wall that currently exists in proximity to the Gate. Since then the Gate has still suffered from neglect, the walls and gate-tower having been scaled by modern day rebellious youth – “taggers” – who left their marks in numerous places. In years since the establishment of the park the property south of it was built over by a curling rink, an office structure (100 Main Street) and its adjacent parking lot. In subsequent years the City bought the property back but now finds that it is redundant to its needs. The City of Winnipeg has now arrived at the current course of action to put forth a request for “Expressions of Interest” on the property. Some may wonder about the extent of Upper Fort Garry, in respect to the current landscape. 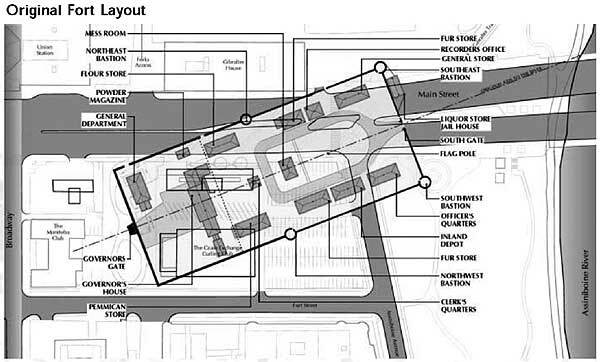 A diagram of the original Upper Fort Garry laid over the current streetscape hints at what heritage resources have yet to be exhaustively explored. Some archaeological work has been done in Bonnycastle Park when Main Street was reconstructed during the construction of the new Main Street bridge, spanning the Assiniboine River. These investigations have suggest that there is much yet to be discovered, especially since significant buildings are connected to the property of concern: a major portion of the Governor’s House, the Northwest Bastion, the Fur Store, the Inland Depot, the Clerk’s quarters and the Mess room. Then there is all the ‘open ground’ between these known buildings that may cover yet more secrets of the Red River’s past history. Under legislation included in the provincial Heritage Resources Act there is a certain measure of protection on the short term. “The Heritage Resources Act encourages and facilitates the protection and conservation of Manitoba’s heritage resources ... A provincially designated heritage site cannot be damaged, destroyed, removed, repaired or developed unless a heritage permit is obtained from the Department of Culture, Heritage and Tourism.” Similar measures are included in City of Winnipeg bylaws that will further impede any immediate redevelopment of the property. Since the City placed a call for “Expressions of Interest” in the local media, there has already a number of topical responses including a proposal by a group known as “Friends of Upper Fort Garry”, lead by the Honourable Peter Liba, former Lieutenant Governor of Manitoba. This group would like the City to rezone the property as park space then develop an interpretive connection between both pre-existing park spaces of the Upper Fort Garry Gate and Bonnycastle Park. In contrast the Downtown BIZ is on record as preferring a combination of retail and housing, that imparts 24-hour usage of the property. Do you agree that this property is one of Winnipeg’s most important pieces of land and thus steps must be taken to evaluate the ethnological and historical resources that lie buried there? Do you agree with the concept that this property should be used strictly for educational and/or recreational purposes? If yes is your answer to both questions then it would appear that it is time once again to step forward and support a plan that addresses this heritage preservation perspective. Be sure to share your concerns. The History Book Club meets at Dalnavert Museum from 7 to 9 pm as indicated below. Please note that the September meeting date has changed because of the Charles Henry Wheeler presentation on September 18. Jack Bumsted will talk about his book Thomas Scott’s Body. Neil Challis will lead the discussion on Ken McCoogan’s Fatal Passage about John Rae. Marg Kentner will lead the discussion on Paul Chiasson’s book Island of the Seven Cities. People who plan to attend the meetings are asked to phone Judith Hudson Beattie (204-475-6666) so that she can arrange for refreshments.